Happened so that during numerous latest outfit shoots I've been caught making casual selfies with palm trees, on coolest vertical striped stairs or with some local Riga scenery at the background. Well, if the last one was a thought through idea for one of my MINOX by KUMMA looks, where selfie-ing process and smartphone in general were an essential part of the story, then the second case from the Stripes on Stripes story we came up with right during the shoot and here the selfie-ing process turned to be a perfect match for the overall visual story. This little gallery from behind the scenes of the selfie-ing process actually brought me to mind that a little 'Selfie Mania' talk is required. Digital era and the rise of gadgets. We keep thanking the creators of it all every single day for giving us a chance to somehow feel united, connected and the rest with people we seriously don't even know. Getting news from the other side of the ocean is now a matter of several minutes rather than hours, days or weeks. Let's take it all to another level. We mainly receive information visually - images, videos, even text when it's typed on a piece of 'old school' or digital paper. Social media is playing a really huge part now in providing us with loads of information regarding every single imaginable topic - fashion, sports, music, art and even politics. 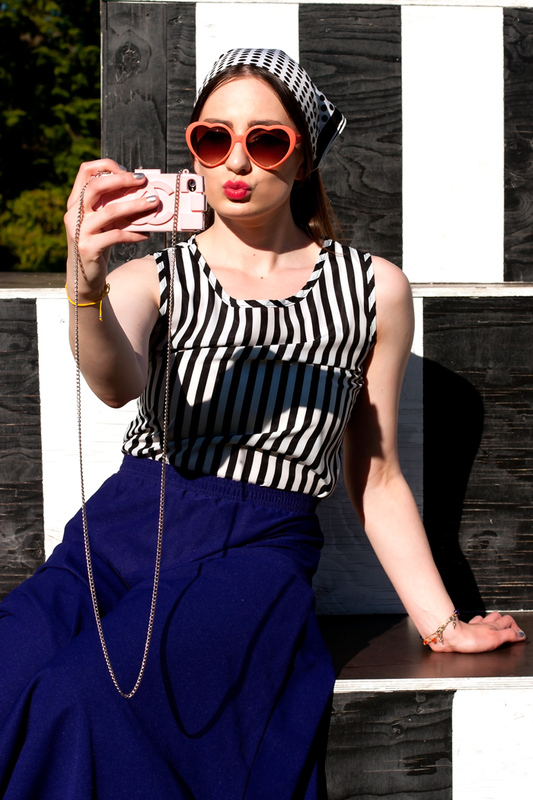 Well, social media has played an important part in the rise of 'selfie mania'. Seriously, if it wasn't the social media and #selfie hastags, we could probably never faced the word 'selfie' getting into Oxford's Dictionary. Imagine all these selfie-style photos alone or with friends/family/mates staying in our gadgets forever. Or in our digital photo albums, somewhere on laptops or iCloud. Just joking. Selfie-style photos have always been there, if you're aware of Mr. Been movies or Colin Powell's self-portrait from 60 years ago (aka mirror selfie), then you know what am I trying to say. It's been there before, long before modern gadgets made it reach mania level. Anyway, there are obvious advantages of a 'selfie movement'. And the main is - you don't need to ask other people to take a photo of you whether you are alone or with a group of people. You just take your smartphone out and click that button. And voila! Minute later you have a dozen of images of, let's say, ""Hey, here am I just right next to Big Ben!" or "Partying all night, sleeping all day with my crew" and blah, blah, blah, you know it all. Having a chance to capture memorable moments with you own self being in a photo is probably good. Unless it all causes serious troubles, like a museum visitor breaking nearly ancient statue while trying to make that damn selfie or a girl shooting herself when making such a badass self-shot (excuse my sarcasm at this point). It's just beyond my ken. Well, am guilty like everyone else - I remember times, like maybe a year ago or so the latest, when I used to bomb my feeds with endless number of selfies. I couldn't stop selfie-ing myself and my day could usually start with an essential selfie-style shot in elevator's mirror. The truth is, the stir or what was it anyways is not that strong anymore.